The article reproduced below was one of the texts prepared of the Alresford Historical and Literary Society Publication “Alresford Articles”, written by Nicholas Denbow, one of the editors, from information supplied by Elizabeth Johnson, explaining the history of the bells of St John’s Church in Alresford. Elizabeth Johnson, of Haig Road in Alresford, is the Tower Secretary at St John’s. The article was eventually published in Alresford Articles, Volume 2, in 2013. See http://www.alresfordhistandlit.co.uk. Most of the photos in this article were provided by Godfrey Andrews from his collection at http://www.alresfordheritage.co.uk, and are his copyright. Early in 2011 it was discovered in a routine inspection that the frame and fittings for the eight bells in the tower of St John’s Church in New Alresford needed structural repairs. Constant ringing for over 75 years had caused wear and tear to the gudgeon pins and bearings on which the bells swing. The estimated cost was £12000, a significant amount, but because these bells are one of the best sounding rings of eight in Hampshire, an appeal was launched to coincide with the 200th anniversary of these bells being rung for the first time, in 1811. As a result of the successful local appeal and various fund-raising events – significantly a major concert in the Church – the money required was raised, and the work was commenced. Returning to Alresford, the bells were re-installed, and the ball-race bearings (supplied in 1936, but still all in good condition) of all the bells were cleaned, re-packed with grease and fitted with new seals. The bolts securing the bells were replaced with new galvanised bolts, but the bells were not turned: this had been done in 1896. Local bell-ringers assisted the Whites staff in this work, providing the man-power and saving further cost. This vital repair work was only made possible by the fantastic fundraising of so many people, and by generous donations from individuals and from various organisations in the town. Major donations were made by Barclays Bank, Alresford Pigs Association, Alresford Rotary Club and Alresford Town Council. In addition, a sell-out concert held in the Church on 10th December 2011, hosted by TV presenter Debbie Thrower, raised over £8000: guest performances were by classical pianist Di Xiao, and West End musical star Gina Beck, with the Hampshire Youth Choir led by their director of music, Keith Clark. Thanks are due to all the audience, who paid to attend, and to all the sponsors: the meticulous musical organization by Keith Clark meant that all enjoyed a truly special musical feast. Elizabeth Johnson, the Tower Secretary at St John’s, commented on the completion of the work: “The whole installation was thoroughly checked over, and now is in tip-top condition. The bells can now ring out safely for many years to come.” Maybe until another Jubilee, in 2111 or later. While the headstocks were being repaired, local firms had carried out associated work. Steve Ogden cleaned and repainted the whole bell frame and supporting girders. Butler and King renewed the electrical wiring and installed emergency safety lighting in the tower. Alterations and improvements were made in the tower to make access to the bells and roof safer. Eight new bell ropes, which were paid for separately as a result of a generous donation from a parishioner, and by the St John’s bell ringers, were also installed. The bells, silent for a few days, were brought back into operation for services on 12th February 2012, and were able to ring out for Queen Elizabeth’s Diamond Jubilee celebrations later in the year. It is planned that a plaque will shortly be placed on the tower to commemorate the fund raising by the community and the work done to restore the bells for this Jubilee. The Liberty of Alresford, comprising the parishes of Old Alresford, New Alresford and Medstead, was probably granted by Cynegils (King of the West Saxons from 611 to 643 AD) to the Bishop of Winchester, upon his baptism. Here the Mother Church was in the major settlement of Old Alresford, which had a chapelry at St John’s in New Alresford, to serve the community on the south side of the Alresford Marsh (pre-dating the Great Weir and the pond). St John’s was built on the high knoll almost due south of the mother church, on the opposite bank of the marsh. When Godfrey de Lucy built the Great Weir in 1289 he re-planned New Alresford village with some 120 families and dwellings north of the Church, which he probably modernized/rebuilt. It would have had a timber roof covered with local reed thatching, and also had a tower. Four serious fires occurred in the 17th Century: the worst in May 1689, when fire broke out in the Soke and was fanned by a northeast wind. It destroyed the whole village and the Church. This was rebuilt in the basic plan that we see today, with the western tower, walls and galleries. The small northern door on the north side of the Church tower was blocked up when the larger west door was made, in 1765, to accommodate the town’s fire engine: this was housed in the tower until 1857. 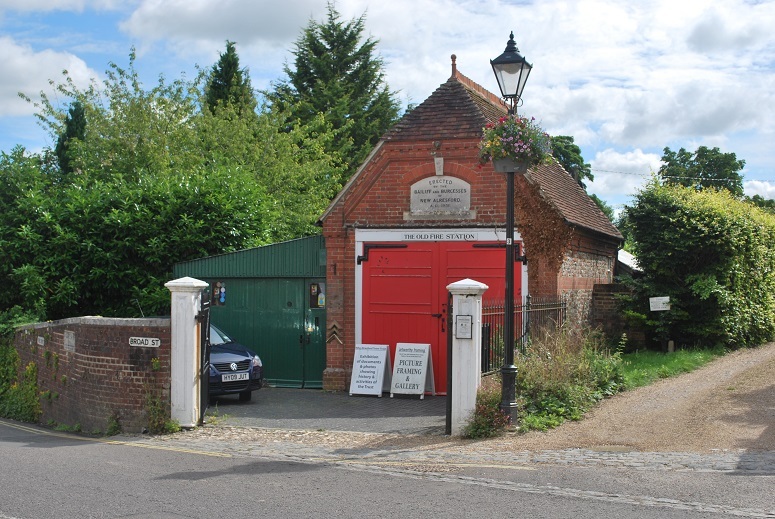 In 1851, George Sumner was the incumbent at Old Alresford: he separated the two parishes and William Brodie was inducted as the first Rector of New Alresford. (George Sumner went on to become Bishop of Guildford, and his wife Mary Sumner established what was to become the Mother’s Union). 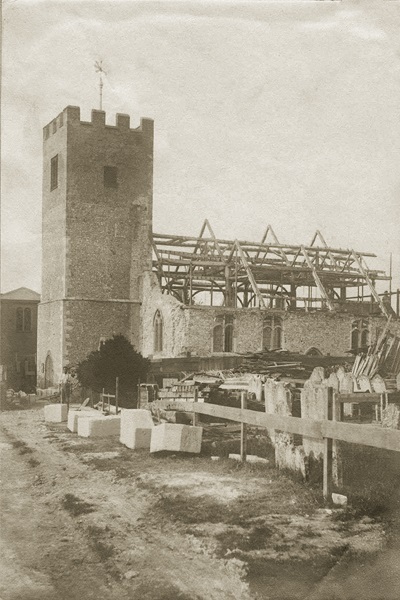 In 1895, the Church was in need of a further rebuild, and this took place under the direction of Sir Arthur Blomfield, the Diocesan architect to Winchester Cathedral. At St John’s, the western tower and main entrance to the Church has probably housed bells since at least the 1689 rebuild. 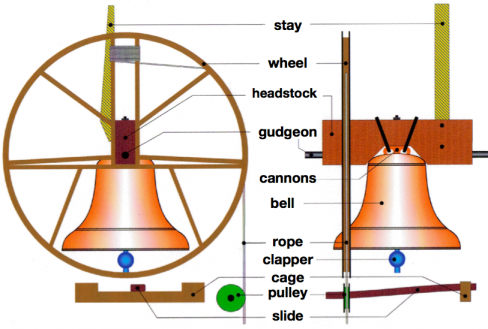 The history of the bells before 1811 is unclear. We do know from Churchwarden’s accounts that in 1803, the bells were rung the whole day, to celebrate that King George III passed through the town – and also earlier, in 1789 to celebrate his happy recovery from an illness! It is often quoted that in 1811 the six existing bells were recast and augmented to eight. More likely the eight bells supplied by the Whitechapel foundry in 1811 were new bells: nothing in the invoice records suggests that these were recast from old material. Since 1811 the tower has housed a ring of eight bells, hung for full circle ringing and tuned to the key of E.
The Robert Boyes’ Survey of Tithes and Properties of 1574-1730 (Ref 1), fields called East Bell Field and West Bell Field are shown to the south of the Avenue, and East of New Farm Road in Alresford. Churchwarden’s accounts for the Church of St John’s in Winchester show that [bell casting] work was done for them by John Cole of Alresford (Ref 2). Rev Colchester of New Alresford, 1922-25, suggests that the letters A cast into the crown of the treble in St John’s Winchester, dated 1574, means that the bell was originally cast for Alresford (Ref 3). This bell still hangs, cracked, in St John’s, with four others. Also, in 1761, the Upham church accounts record that Thos Swain, of Alresford, cast bells for their church (Ref 4). 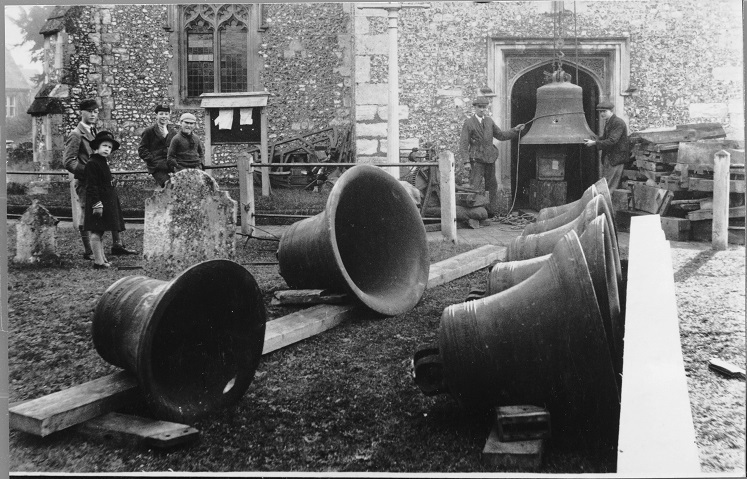 So probably Alresford had locally cast bells until 1811, and possibly those bells, when discarded in 1811, were actually passed to, or recast for others, via a local foundry. In 1811, T Mears of Whitechapel Foundry was paid £255 for the eight new bells, and a Mr Dyer £61 for hanging them. While this was to have come from public subscription, a debt of £150 plus five years interest was still outstanding in 1820: this was resolved by repaying £50 per annum out of the rates levied on the parishioners. At that time, the bells were hung in a wooden frame. The Hampshire Chronicle reported that the new bells were first rung on 25 March 1811. Note that the clock on St John’s tower was paid for by the Bailiff and Burgesses of New Alresford in 1811, and the face is inscribed with the date of 1811: it was coincidentally in February that year that George, Prince of Wales, became Prince Regent, and then King George IV. When St John’s Church was rebuilt by Sir Arthur Blomfield in 1895, the tower remained untouched: but the bells were rehung with new fittings, the frame strengthened, and the bells quarter turned. The cost was £142.10s, raised by public subscription, and the work carried out by Whitechapel Foundry. The opening peal, a Kent Treble Bob Major, was on 22 December 1897, rung in the tower, but with no Church attached: it had been demolished to walls just six feet high! The work on the bells is commemorated by a brass plaque in the Church porch, as a celebration of the Diamond Jubilee of Queen Victoria. In 1936 the treble was found to have a crack, and it was recast by Taylors of Loughborough. At the same time the rest of the bells were ‘re-tuned’ [maybe just turned] and rehung in an iron frame, also made by Taylors. A plaque in the Church porch commemorates this as a Silver Jubilee celebration for King George V, so the bells have been linked to many royal jubilees and celebrations over the years, continuing up to 2012! 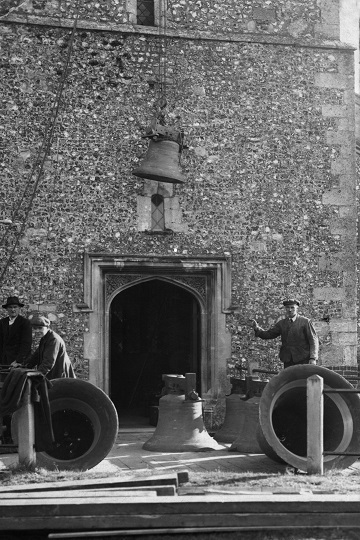 Rehanging the bells in 1936. Mine shall be the first to lead the dulcet peal. Does battle rage, do sanguine foes contend. The bells are rung for approximately 45 minutes before the main morning and evening Sunday services, for other special occasions, and for weddings and funerals by request. Each Friday evening there is a practice session. The bells are rung by a band of ringers drawn from Alresford and the surrounding area. All are members of the Winchester and Portsmouth Diocesan Guild of Ringers (Ref 5), a society that promotes the education of ringers and cooperation between ringers to maintain and ring the bells of the Diocese. (1) HRO 45 M83/PZI Survey and Account of Titles in New Alresford. (2) Bell Founding in Alresford, Elizabeth Johnson, Alresford Displayed 21, 1996, Paper 98. A challenge for you! Where have old railway carriages been used as dwellings or residences in Alresford? 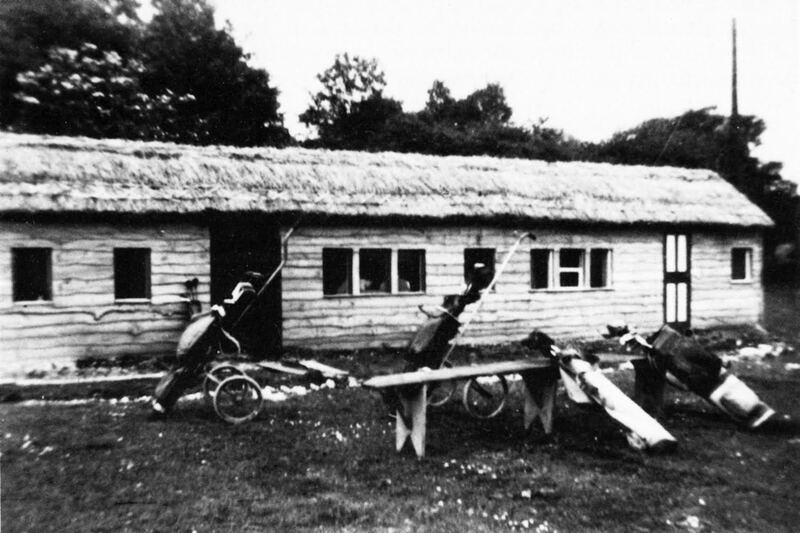 We have reported on one such railway carriage, used as the Golf Course Clubhouse in around 1954, by the side of the first tee, across the road from the Cricketer’s pub. What we need here is any old photo of anyone in front of this clubhouse winning a trophy or whatever – maybe just drowning their sorrows! Alresfordheritage.co.uk came up with this image of a well clad carriage on the grass opposite the Cricketer’s! The next challenge is from around the same time, 1954, but has anyone any memories or photos of the railway carriages used at the top of the hill on Jacklyn’s Lane, near the old water tower? Pat Bentley used to deliver papers to a lady who lived in one of these carriages: who was she, and have you any photos? The photo above is said to be in Alresford: where is it? Who is the young schoolboy in his uniform? Please let us know, particularly if this was you! In around the year 1490, the Bishop of Winchester, the principal landlord of all the dwellings situated in New Alresford, gave authority to establish nine local men as Bailiff and Burgesses: they were to be elected locally to recognize their corporate responsibility to ensure that the town thrived on behalf of its principal landlord – ie the Bishop. The Charter states that these nine men, of ‘ye betar and more honest Inhabitance of our town and Burrough were to be chosen, one of whom was to be Bailiff whilst the others were named Burgesses. These men were charged with the organisation of the fairs and markets and the income from these activities was then to be applied according to the resolution passed at the meetings of the Bailiff and Burgesses’. So they were self-elected, taken from the “better” members of the community. The Bailiff and Burgesses acted as the trading standards authority, the town planning authority, and spent their income to improve the town and its facilities. But in 1886 the Municipal Corporations Act led to the dissolution of the “Corporation of the Bailiff and Burgesses”, and led to the establishment of the New Alresford Parish Council to take over most of their responsibilities. So the Fire Station was there, all they needed now was a fire engine! Eventually it arrived. 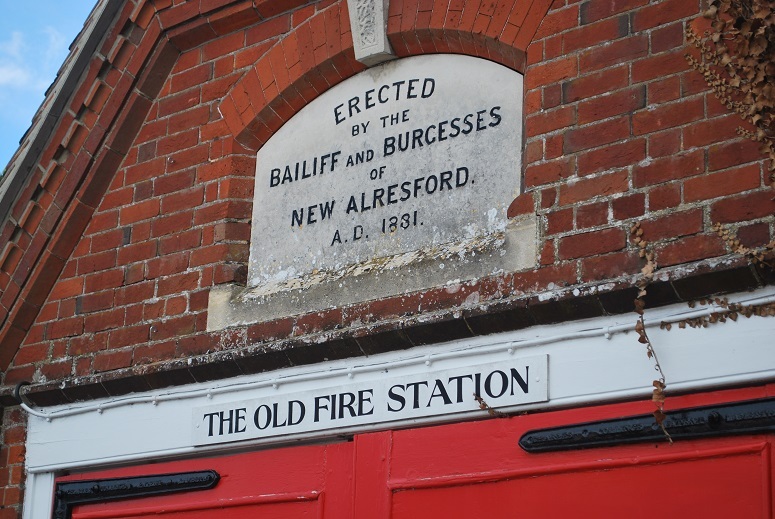 The Fire Station still stands as a memorial to the activities of the Bailiff and Burgesses of Alresford, and the fire engine is preserved in the new fire station. 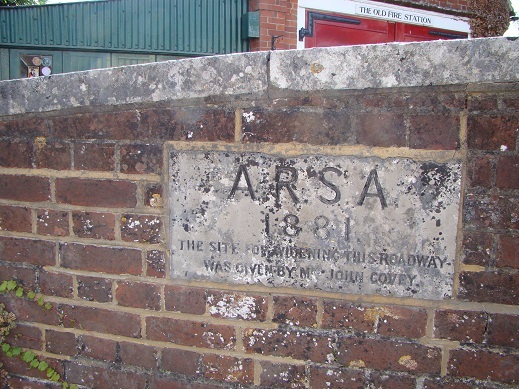 The various activities of the Burgesses that were not transferred to the Parish Council were taken over by the New Alresford Town Trustees, a charity based organization formed to collect market tolls and hold the land and building assets of the Burgesses, which included the Old Fire Station. The NATT today still follows the principles laid down by the charter that established the Bailiff and Burgesses of the town, in around 1490. The title deeds for this property show that it was sold in 1694 by Priscilla Worlidge and Rebecca Worlidge of Bramdean, spinsters, to Daniel Veck the younger, of New Alresford, fellmonger (dealer in hides or skins, particularly sheepskins). It was then described as a parcel of ground with a frontage of 34 feet. In 1704 Daniel Veck mortgaged it to William Fry (of West Tisted, a brickburner), when there was a messmate on the land. In 1743 Veck’s son John transferred the property to his son, another Daniel. In 1777 Daniel Veck leased it for 14 years to John Hart junior and Bulbeck Dancaster the younger, woolstaplers. By 1843 the property had passed to the Revd. Henry Aubrey Veck of Forton, Alverstoke (son of Richard Aubrey Veck and Elizabeth his wife). His widow Dorothy sold it to William Bailey, boot and shoe maker. William Bailey died in 1880, and the building, now occupied as two separate tenements by William Bailey and George Hall, was sold to Mrs Susanna Eliza Covey, the wife of John Covey quoted above. In 1881 Mrs Covey sold the property to the Bailiff and Burgesses of New Alresford; it was vested in the Town Trustees in 1890. Eventually it was used to house the horse drawn fire engine for the town: in around 1985 it was leased to George and Beryl Watson, furniture restorers and picture framers, and it is now (2013) operated as a picture framing business by Artworthy Framing.